A familiar sight for students walking to and from North Campus will soon become a distant memory. The tenement buildings located at the base of the University Avenue bridge will be torn down, as originally reported in The Lowell Sun last week. The buildings are being torn down to make way for the university’s plans to construct a park that is more pedestrian-friendly for students commuting on foot to North Campus. In summer of this year, the buildings will be torn down, and the park will undergo construction the following summer. BSC Group, which has previously worked with the university on numerous parking lots located across the three main campuses, will be designing the park for the university. According to their website, the firm will also oversee the demolition of the vacant tenement buildings. UMass Lowell purchased the properties located at 193 and 199 Pawtucket Street back in 2015 with the intention of demolishing the buildings and constructing a space that would be a safer area for students to walk. Adam Baacke, the director of campus planning and management at UMass Lowell, said in a phone interview on Mar. 29 that the university estimated that at least 7,000 students each day walked past the current narrow footbridge on busy Pawtucket Street. “The university wanted to ultimately acquire that property [because] it would enable us to move the primary walking bridge between the two campuses away from the street so it would create… a more pleasant and safer experience,” he said. However, the university faced a significant issue with their Overlook Park plans: the buildings were considered “contributing structures to a historic district” according to the Massachusetts Historic Commission. Much of where East Campus stands today marks the grave of what used to be Little Canada, a neighborhood composed of French-Canadian immigrants who worked in the mills of old. In the 1960s, urban renewal swept across the country and landed in Lowell; most of the houses that comprised Little Canada were destroyed to make space for new dormitories for Lowell Tech, which combined with the University of Lowell in 1991 to form UMass Lowell. 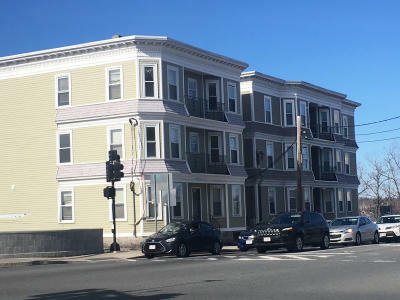 The properties at the base of the University Avenue bridge are the survivors of that localized district and one of the last remaining three-decker wood frame tenements left in Lowell, according to Lowell National Historical Park (LNHP) superintendent Celeste Bernardo. The designation of those buildings created a roadblock: for the demolition to be approved, the university had to argue that there was no other viable option other than demolition for them to achieve their goals of constructing the park. A consulting party made up of the LNHP and the Lowell Historic Board proposed numerous alternatives for the university to consider instead of demolishing the properties. Back in March of last year, the Lowell Sun reported that the university and the LNHP were looking to have the buildings bought and relocated. That would allow them to renovate the property while the buildings would be preserved. The properties received significant interest from potential investors according to Baacke. However, that option was not financially feasible and unfortunately fell away leaving demolition the only viable option. The Massachusetts Historical Commission agreed that demolition was the only option and thereby “accept(ed) the adverse effect” of the Overlook Park project according to a memorandum supplied to both The Sun and The Connector. But in order for the park construction to move forward, the memorandum stated that there would be stipulations that would support the LNHP and Historic Board’s missions of historic preservation. UMass Lowell will construct a series of plaques dedicated to the history of Little Canada to be placed in the park. As another condition, the university will also photograph the interiors of the tenements to build up archive records. The university also agrees to support historic archives with funding and to provide financial support to construct a connection between canal-ways on School St. and Francis Gate Park. While Bernardo and the LNHP are not pleased to see the building demolished, she said that she “supports the mitigation” and the collaborative relationship between both UMass Lowell and the LNHP that will continue to blossom in the following years. Baacke and the university said that the unexpected delay in finalizing plans for Overlook Park took over two years, but the outcome was beneficial for both the university and the city at large by providing a green space for pedestrians and uncomplicating the Pawtucket-University Avenue intersection for motorists.